When you think of the state of Oregon you may conjure up images of the city of Portland, known for hipsters and craft beer. Or maybe you think of lumberjacks sporting denim coveralls while chopping down old growth timber. Well, we have all of that… and so much more. 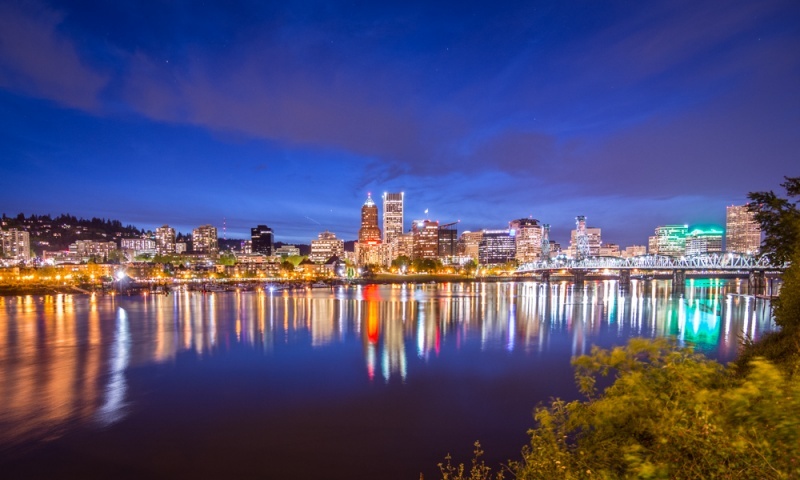 Oregon has gorgeous waterfalls, arid deserts, snowcapped mountains, cascading rivers, steaming hot springs, a beautiful coastline, and the friendliest of locals. I could go on and on about this amazing state. And I will, below. So read on to learn all about my favorite places in the great state of Oregon! Crater Lake is located in Central Oregon and is a part of the US National Parks system. Several thousand years ago Mount Mazama collapsed after a massive eruption and formed this volcanic caldera. The lake is estimated to be just over 2,000 feet deep – the deepest in the entire US and the 3rd deepest in the world. Although some people believe it has no bottom. The lake has an intense blue color and is unbelievably clear. Floating at the surface is the “Old Man of the Lake”, a tree log that has been bobbing vertically for 100 years. There are many hiking trails around Crater Lake. And weather permitting you can even hike down to the rim of the lake and have a swim in the frigid water. There are several campsites in the park (beware, they close in the winter) and a gorgeous lodge. Hood River is a quaint little town about an hour east of Portland in the Columbia River Gorge National Scenic Area. It draws hundreds of kiteboarders from around the country due to its ideal windy conditions. But even if you don’t kiteboard or windsurf, Hood River is an ideal place to spend a long weekend. With delicious brunch spots, lively breweries with industrial-style tasting rooms, cute boutiques, and art galleries lining the pedestrian-friendly downtown, you’ll have plenty to fill up your days. It’s a perfect stop to add your Pacific Northwest road trip itinerary. East of John Day, Oregon, in the Malheur National Forest, you’ll find 68,700 acres of beauty called the Strawberry Mountain Wilderness. The aptly named Strawberry Mountain Range providse a picturesque backdrop to the lush vegetation you’ll find here. And Strawberry Lake is in this area as well. The trail is a 6.2 heavily trafficked out and back that is moderate in difficulty. 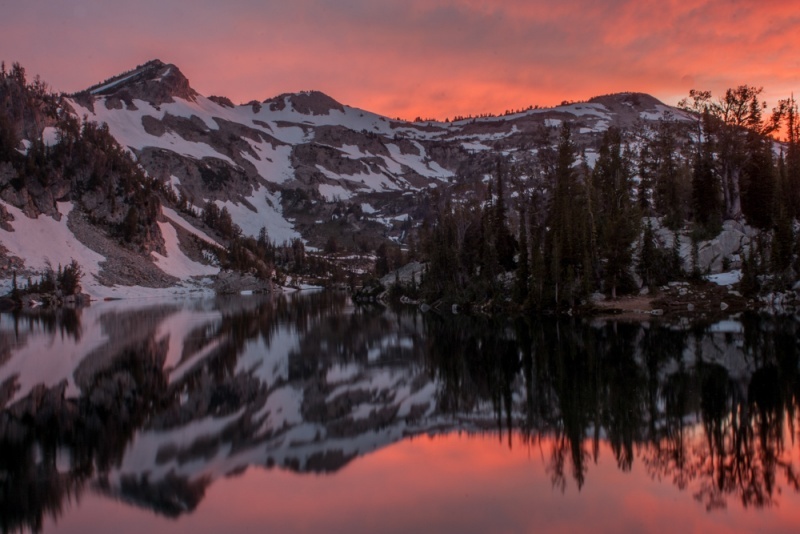 You’ll get to see both Strawberry Lake and Little Strawberry Lake. The reflection off of this amazing high-elevation, shallow lake is quite spectacular. If you’re a fishing enthusiast, you’ll be happy to know that the lake is stocked with trout and fishing here is permitted. And in the winter you can reach the frozen lake with cross country skies or snowshoes. The idyllic Strawberry Camp sits along Strawberry Creek and this is where the hike to the lake begins. This area is not a popular tourist destination so you’ll find a good amount of peace and quiet here. It’s the perfect place to spend a weekend camping and hiking in the beautiful Oregon wilderness! Plus how cute is it that everything here is named after a piece of fruit? Most people don’t know that there is a massive dry lakebed in Southeastern Oregon, in the shadows of the Steens Mountains. The playa here is similar to Black Rock City, where Burning Man is held every year, but smaller and far less crowded. This 12×7 mile desert wasteland is the perfect place to go if you want to camp in the middle of a giant playa or set land speed records. There are no real rules here other than “leave no trace”. You can just drive onto the lakebed, camp anywhere, and drive as fast as you want. And right on the outskirts of the playa is a privately owned hot springs, general store, toilet (you’ll probably need this at least once during your stay), and a campground with a few more amenities. 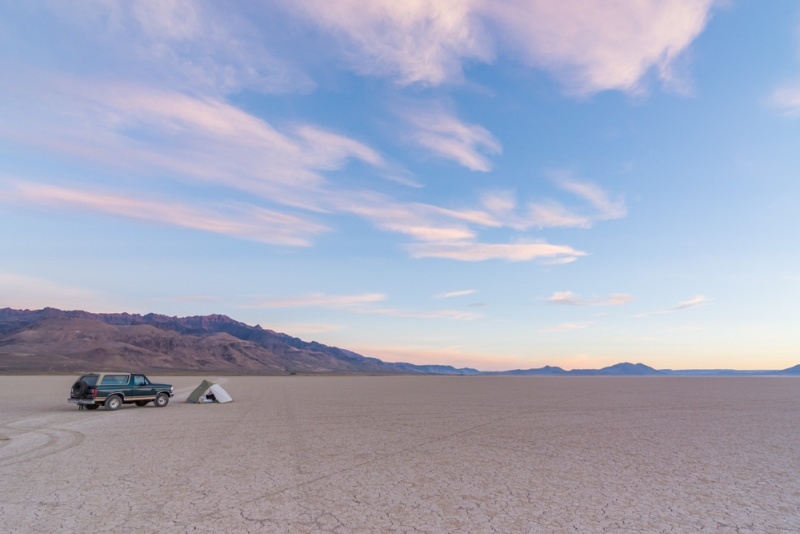 It’s awesome to have a soak in one of the pools, temperatures are “hot” and “scalding”, and then drive onto the playa and find your own little private spot to pitch your tent. And when you wake up in the morning you can cruise around the playa, testing the limits of your car. Be sure to fill up on gas in the nearest town of Fields (population 86) since the Alvord is literally out in the middle of nowhere. A visit to the Painted Hills is like a trip back in time. The hills contain colored stratifications in the soil and the colors of yellow, black, and red appear to have been painted on in long, horizontal brush strokes. The colors are most vibrant in the late afternoon. You’ll want to spend a few hours here, admiring how the colors look different depending on the sun, and wandering along the trails. There are several well-maintained trails in the area if you’d like to get out and stretch your legs. You can also see the hills from your car if you’d prefer. The Journey Through Time Scenic Byway takes you through a ghost town and the town of Fossil which has some fun activities for kids. 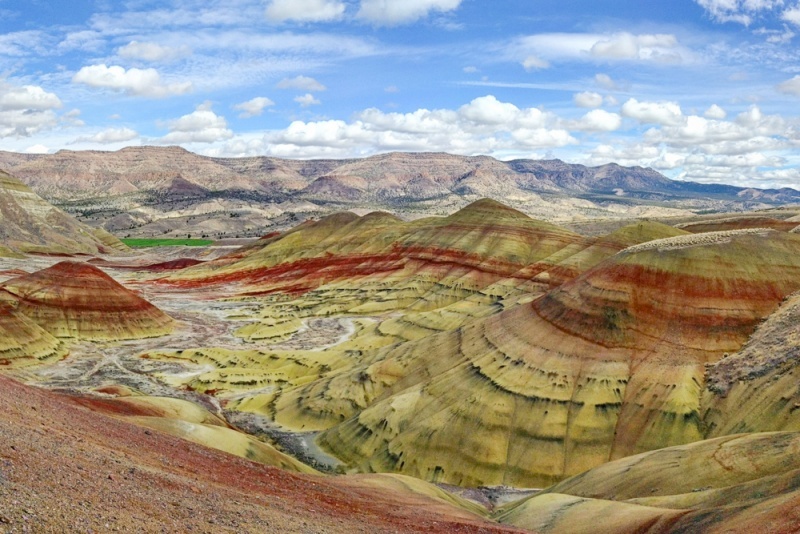 The Painted Hills are one of the Seven Wonders of Oregon (a few others are listed here as well). They are also a part of the John Day Fossil Beds so there are plenty of other amazing landscapes to explore nearby. We especially loved the Blue Basin – walking through the bright blue canyon was like being on another planet! 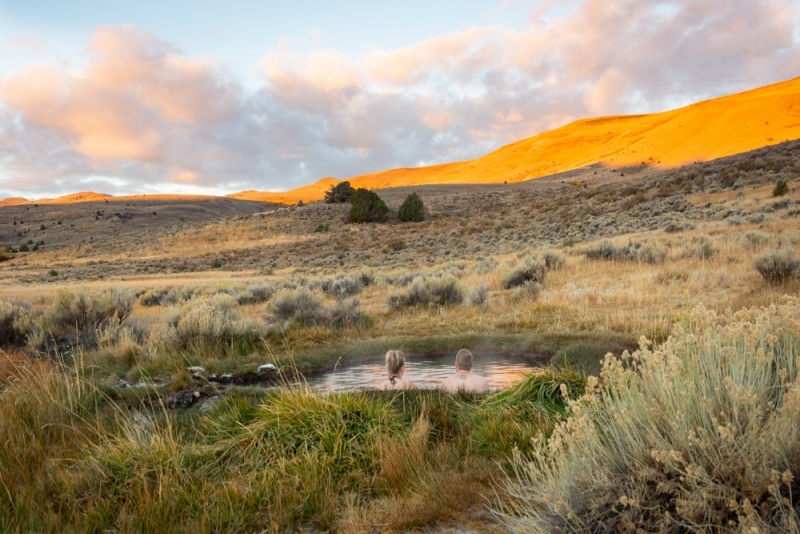 The Hart Mountain National Antelope Refuge is a rugged, backcountry area of land in Southern Oregon that protects over 300 species of wildlife. There are some primary maintained roads, as well as some bumpy, off-roading style roads. You’ll want 4-wheel drive and high clearance here. This is also an area that is open to hunting during designated seasons to keep the population controlled. Fishing is another popular recreational activity in the area. Most people like to do some wildlife observation and photography as the opportunities here are endless! The real draw to this area, at least for us, was the natural hot springs that is located right near the campground. You can soak in this natural pool while watching the sun sink below the majestic mountains that tower above you. And if you’re lucky, you may spot some wildlife grazing nearby. Located about 3 hours southeast of Portland, Bend is the perfect adventurous town to spend a weekend exploring. 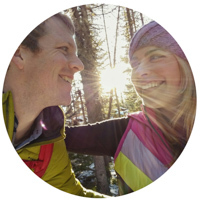 The people who live here tend to love the great outdoors and spend their weekends kayaking in the river that runs through the center of the city, hiking on one of the countless trails nearby, or snowboarding on Mt Bachelor that is just outside of town. 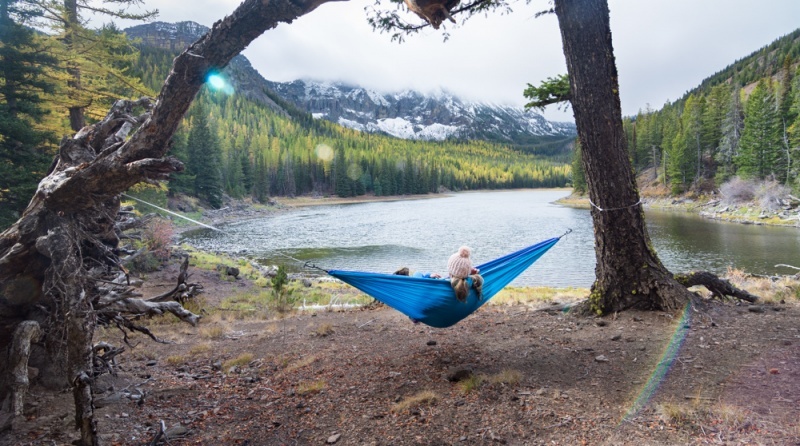 Not only does Bend offer a plethora of outdoor activities, it also has a bunch of craft breweries, cute boutiques, delicious restaurants, fancy mountain lodges, hot pools for lounging, the list goes on and on. It’s definitely a town that you must visit during your trip to Oregon! 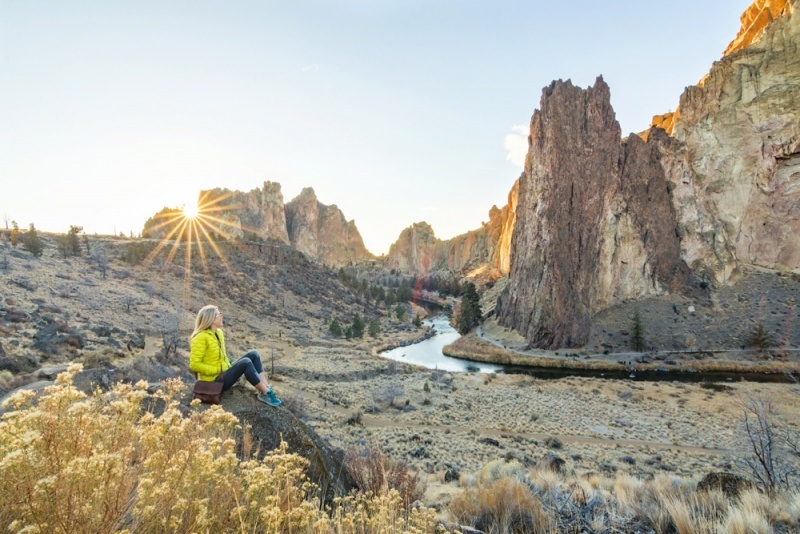 And, of course you must check out Smith Rock State Park during your visit. It’s another of the Seven Wonders of Oregon! The Columbia River cuts through the Cascade Mountains and now provides a natural barrier between Oregon and Washington. Here you’ll find spectacular scenic views and plenty of spots to stop along the way for short or long hikes or just to view the spectacular waterfalls. The Historic Columbia River Highway follows the river and you’ll enjoy the cliffs rising above you, the lush vegetation lining the road, and the many waterfalls cascading from above. Multnomah Falls is crowded but is a must-visit during your drive. Bridal Veil and Latourell Falls are also worth a stop. And if you want to spend a few hours hiking, Dog Mountain Trail, Wahkeena Falls Loop Trail, and Angel’s Rest are all well-maintained and popular trails. And the Vista House provides the most spectacular view of the gorge, it’s a must-stop! Located in northeastern Oregon, near Hells Canyon, are the spectacular Wallowa Mountains. 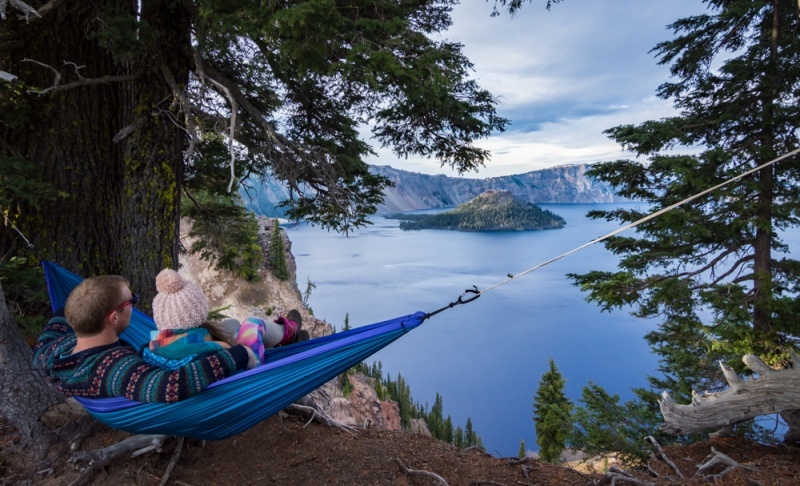 They are popular for outdoor enthusiasts looking to hike and explore the beauty of Oregon. Even if hiking isn’t your activity of choice, you can still enjoy the Wallowa Mountains. The Wallowa Lake Tramway will transport you 3,700 vertical feet to the top of Mount Howard, which is over 8,000 feet tall. Views of the entire area from here are absolutely stunning. There are two miles of relatively easy hiking trails at the top for you to explore. Be sure to stop in the quaint town of Joseph nearby. They have an up-and-coming art, food, and beer scene and a cute downtown area. It’s the perfect place to use as your base before heading into the wilderness for a day of trekking. 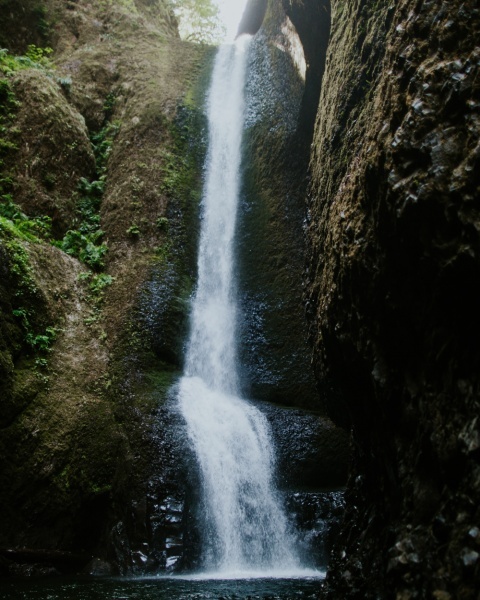 Oneonta Gorge is located in the beautiful Columbia River Gorge and is a popular hiking area for locals and tourists alike. But unlike most hiking trails, there isn’t actually a path. You’ll park, walk down to the water, and start hiking through the creek. Almost immediately you’ll come to a large log jam that you’ll need to scramble over so be careful. There tends to be a bit of a pileup of people here, especially on weekends. 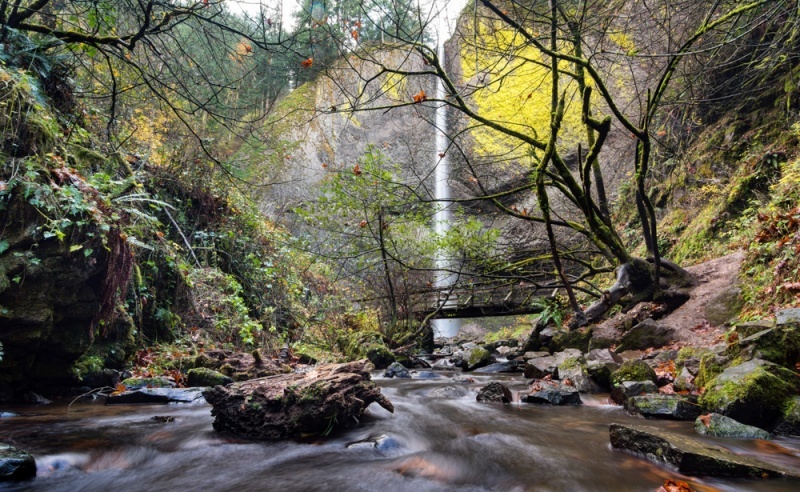 You’ll walk upstream through the water for about a mile until you get to Lower Oneonta Falls. Depending on the season, at times you’ll be wading through chest-deep water which may be difficult for small children unless they can swim. Be sure you are dressed to get wet and wear shoes that have good traction. The waterfall at the end is a nice treat but the adventure of getting there is what you’ll enjoy the most! 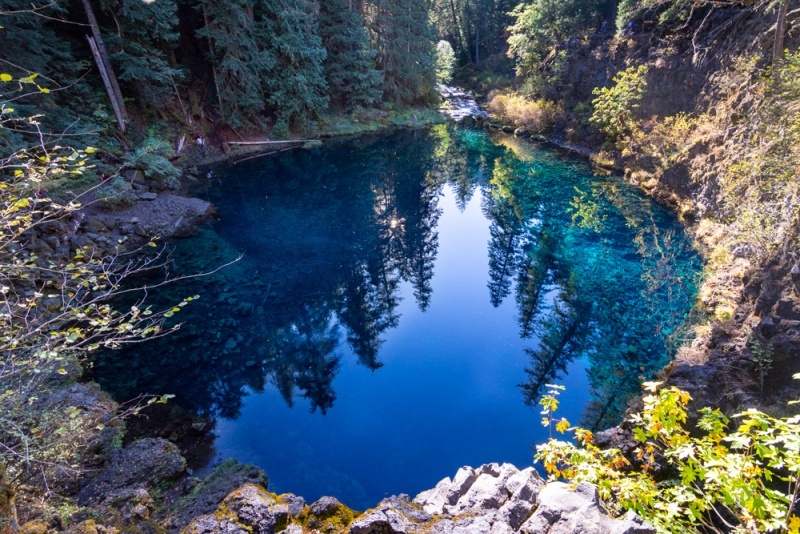 To reach this little piece of bright blue paradise, you’ll need to hike the McKenzie River Trail. It’s kind of on the way to Bend if you’re taking Highway 22 through Salem. The trail is a 3.7 mile well-maintained, heavily trafficked out and back trail that is fairly flat the whole way. Once you reach the end of the hike, you’ll understand what all of the hype is about. Tamolitch Falls (aka “Blue Pools”) is a body of water so blue, and so crystal clear, you won’t even believe that it is real. This was once a waterfall but the river changed course so now this area contains a dry waterfall ledge and a pool beneath that is so clear and so still that it resembles glass. It’s an idyllic place to swim on a hot summer day. And the waterfall ledge is perfect for jumping (check the depth before you leap of course). You’ll love spending an afternoon swimming in this pool of bright blue water! Located in northwestern Oregon, right across the Columbia River from Washington state is the darling little port city of Astoria. You may know it as the setting of the classic movie Goonies. Astoria is the oldest city in the state of Oregon and is a good mix of history with some modern touches that make it an ideal tourist destination. The downtown area is full of restaurants and cafes with dishes that are sure to please any foodie. And the Fort George Brewery, located in an old auto dealership, is a great place to grab a craft brew and sit outside in the sun. There are also a few food trucks here if you need a snack. 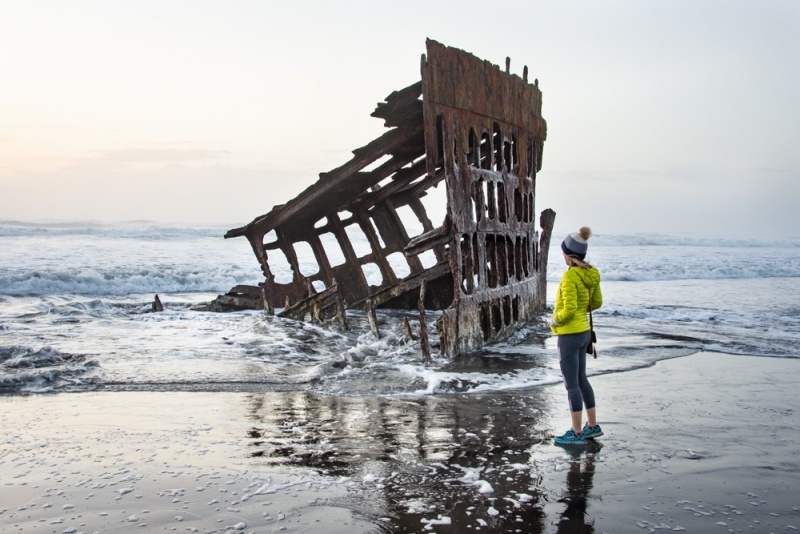 Camping is available at the nearby Fort Stevens State Park where the famous Peter Iredale shipwreck remains still sits on the beach. Fort Stevens was once a military defense area that was in service for 84 years. And today it is a large park with campgrounds, hiking and biking trails, a military fort, and plenty of opportunities to see wildlife. Spend a few days enjoying the state park, the coast, and the cute little town of Astoria! Haystack Rock is a giant rock that sits right on the coast in Cannon Beach. 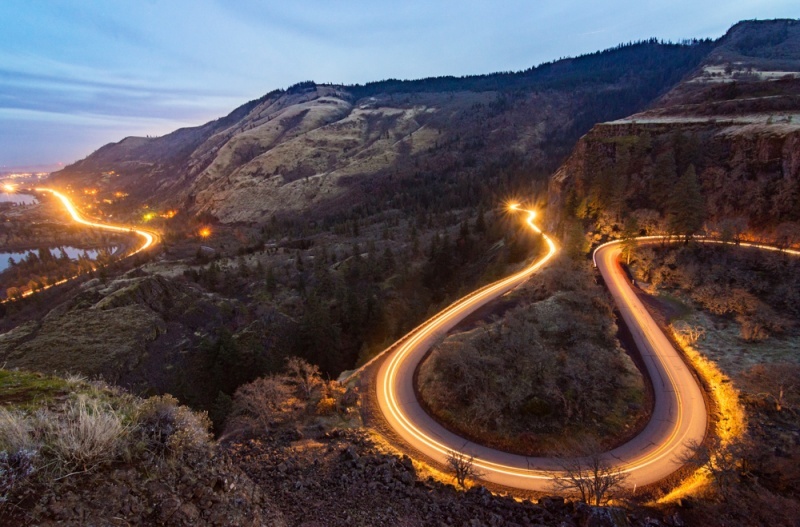 It is one of the most recognizable and popular landmarks in the state of Oregon. Rising 235 feet from the sand, this large rock is home to some interesting sea life and bird species. You can walk right up to it at low tide. Cannon Beach is located in northwestern Oregon, not far from Astoria. The beaches in Oregon are often referred to as “the coast” as opposed to “the beach” because both the air and the water are generally pretty chilly. 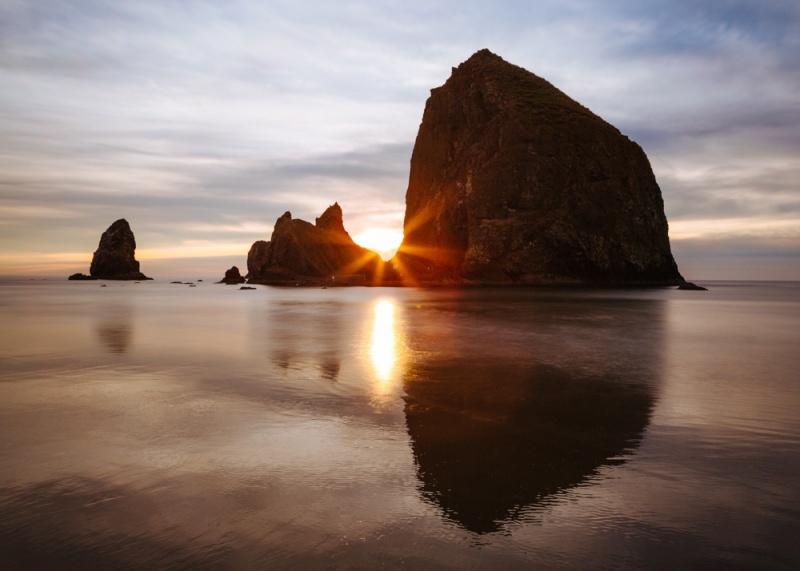 So you may not want to come here for the sunbathing opportunities, but you will want to visit Cannon Beach for the beautiful views of the sea, the soft sand, and the cute little town with shops and cafes galore! If you have some extra time, the entire stretch of Highway 101 is quite spectacular and worth the drive. Mt. 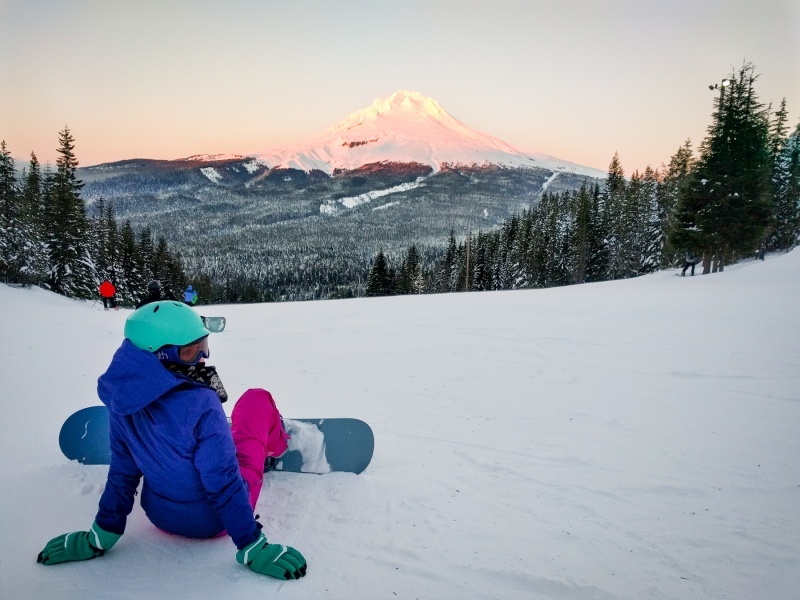 Hood is another of the Seven Wonders of Oregon, and for good reason. At over 11,000 feet, you can spot this behemoth all the way from Portland’s city center! It is the tallest mountain in Oregon and the 4th tallest in the Cascade Mountain Range. Located just about an hour outside of Portland, Mt. Hood is a popular destination for weekend warriors looking to do some skiing, snowboarding, snowshoeing, or tubing during the cold winter months. There is a cozy mountain lodge here, perfect to warm yourself with a hot toddy after a long day in the snow. In the summer months there are popular trekking opportunities on Mt. Hood. The trek to the summit is difficult and not for the faint of heart. There is also a ring trail called the Timberline Trail that allows you to hike around the base of the mountain. It takes a few days so you’ll need to carry all of your camping gear and food. But the landscape is absolutely breathtaking! And last but not least… no trip to Oregon is complete without a few days in Portland! This weird wonderland is full of hipsters drinking overpriced brews (coffee and beer) while talking about how great Portland used to be. You’ll find the craziest donut concoctions, lively outdoor markets, some of the best cuisine in all of the US, a gorgeous city skyline, and more. We love Portland so much that we’ve written several complete posts about it! Start here and work your way through all of them. Planning a trip to Oregon? Check out our favorite travel guides for more inspiration! Amazing Post, maybe someday can I visit one of this magical places!